Prof. Andrzej Dziembowski from the Institute of Biochemistry and Biophysics of the Polish Academy of Sciences in Warsaw has won the 2018 Foundation for Polish Science Prize in the field of life and earth sciences for explaining the function of key enzymes involved in RNA degradation, the dysfunction of which leads to pathological states. The 2018 Foundation for Polish Science Prize is awarded in recognition of Prof. Andrzej Dziembowski’s groundbreaking discoveries involving degradation of RNA in cells. He described the molecular mechanism for operation of an important protein complex, the exosome, constituting the “command centre” for RNA metabolism. Mutations in one of the subunits of the exosome lead to the development of multiple myeloma (a bone marrow cancer). Knowledge on the functioning of the exosome has led to the proposal of a new therapeutic approach to treatment of myeloma. Prof. Dziembowski also discovered the function of another enzyme of RNA degradation (DIS3L2), mutations in which lead to Perlman syndrome (a set of genetic defects characterized by prenatal overgrowth). Enzymes degrading RNA play a key role in regulating the expression of genes. If mutations appear negatively affecting the function of these enzymes, RNA is not properly distributed and proteins are produced by the cell defectively or in unnatural quantities. This can lead to the development of cancers, as in the case of Perlman syndrome, manifest in foetal gigantism and overgrowth of organs, leading to the child’s death. To treat similar illnesses in the future, scientists must learn more about the metabolism of RNA. Molecules of mRNA constitute the matrix for production of proteins in cells. They are a copy of the “recipe” for a protein, the main recipe for which is recorded in DNA. Specific proteins only arise when the mRNA molecules coding them are active in the cytoplasm. Afterwards, this “recipe card” decomposes, i.e. undergoes degradation. The stability of mRNA molecules and their concentration in the cytoplasm are strictly regulated. When Dziembowski began his research, there wasn’t much knowledge of enzymes degrading RNA. The laureate of this year’s FNP Prize went on to describe the function of many such enzymes, becoming a global authority in this field. From his work on yeast, Dziembowski turned to research on animal and human models. Higher organisms have developed many pathways, i.e. processes leading to degradation of RNA. The laureate developed his own methods for seeking out unknown factors involved in these processes and identifying the genes connected with RNA metabolism. In recent years, Prof. Dziembowski’s research interests have expanded to include other aspects of RNA metabolism. His team recently published the results of research showing a previously unknown method of blocking the proliferation of repeated sequences, LINE-1, in human DNA. These sequences make up 17% of our DNA and replicate using RNA as a carrier. The newly described pathway ensures the stability of our genome. Prof. Andrzej Dziembowski (born 1974) is a molecular biologist, biochemist, and geneticist. He earned his undergraduate degree and doctorate at the Faculty of Biology at the University of Warsaw, where he continues to conduct lectures for students. 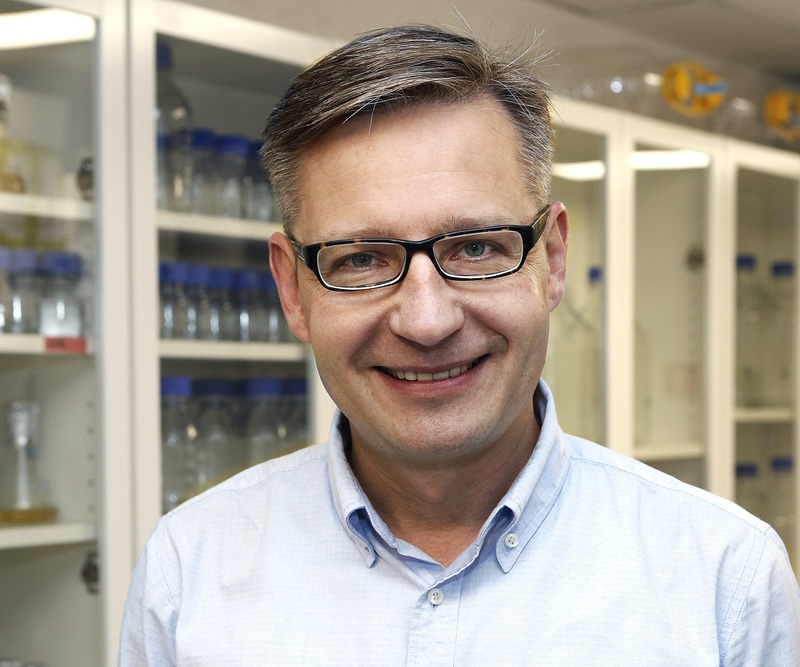 He heads an independent lab at the Institute of Biochemistry and Biophysics of the Polish Academy of Sciences in Warsaw. For several years he worked at the CNRS Molecular Genetics Centre in Gif-sur-Yvette, France. Apart from Polish fellowships and grants, he has won a prestigious European Research Council grant for researchers launching promising projects, as well as grants in the EU’s 6th and 7th Framework Programmes. For his work he has won the Prime Minister’s Award twice, the National Science Centre Award, and the Knight’s Cross of the Order of Polonia Restituta. He has published scientific articles in prestigious journals of molecular biology, including Nature, Cell, Nature Structural and Molecular Biology, Nature Communications, Genes and Development, Molecular Cell, EMBO Journal and EMBO Reports. He is the co-author of many review articles in international peer-reviewed journals and chapters in specialized books. He also serves as a reviewer.